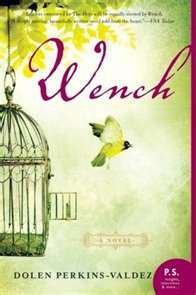 Wench is a carefully rendered story about emotional complexities and violence in master/slave relationships of the mid 1800s. Lizzie is a slave who develops a curious relationship with her master, Drayle, that begins with seduction and turns into a kind of love that is punctuated with moments of hurt and disappointment. There is a (albeit completely unequal) power struggle between them after Lizzie bears two mixed children with him. Much of the story takes place at a summertime resort called Tawawa House, where many Southern slave owners brought slave mistresses to spend time with. Lizzie meets other women in her situation, though she is the only one who’s heart is really tangled in her unpredictable pseudo-romance; while her mind is also at work in hopes of offering herself to Drayle in exchange for the freedom of her children. The novel highlights the different relationships the slave women have with these white men and treads around the awkward dangerousness the women experience on a daily basis.